Well, we'll see if I make it to Five Things. 2. As well, we have a Nine coming to spend the day while her teachers take on some Professional Development. In the afternoon, a Five and a Three arrive with their Mama for a visit (there will be some splashing in the fountain, I predict with confidence). . . and they will all stay for dinner, joined by the Nine's parents when they finish work. Pater has promised cabbage rolls (I know, more winter than spring, but he's very happy to share a vegetarian recipe he's been working on, inspired by a dish I had at Portland's Little Bird restaurant last month) and I'm on the hook for two apple pies. . . So we could sum up #2 as Family Visits. . .
3. I'm not too worried about the two rainy days coming our way because this (finally--a first package was sent out in early February, I believe, but held up at Canada Customs; this second mailing fared better) arrived in yesterday's mail, with many little portraits of the Queen stuck on to the cheery blue envelope, and inside all these inviting colours -- based on London's Tube lines -- in a self-striping sock yarn by Etsy seller Trailing Clouds. I couldn't resist after seeing K-Line's cheery pairs on Instagram. 4. Why hasn't anyone told me about The Honourable Woman? You didn't know I love to see Maggie Gyllenhaal in almost any role? And so many other good actors in this show. . . Sensitive material, admittedly. . . Have any of you watched it? I know it's been out for a few years, so perhaps all of you have watched it and I just missed the chatter. Wouldn't be the first time. . .
5. Besides the Watercolour Classes I'm taking one morning a week for this month and into May, I took a Botanical Illustration class in the neighbourhood this week. Only three hours, but I picked up a few techniques along with some confidence and inspiration. Putting together what I learned in that class, I showed up at my watercolour class yesterday to find the focus was on mixing colours, putting together a colour scheme, before beginning a painting. I realized I had just the subject I wanted in a photograph I'd taken a few days earlier: this one of the Corylopsis Spicata just leafing out -- each leaf unfolds from a beautiful little sheath of burgundy and pale yellow-green, and then is almost Neon for its first days out, with the most intricate pattern of pleats -- I love it! So from that photograph, I did a small study on an Arches watercolour-paper postcard. I've been using these for small paintings through the classes, and the plan is to pen a few words on the back and pop them in the mail, so that I can keep up my Snail Mail intentions. I'm not quite there yet with the colours, but I'm getting close and I've learned what I need to change. 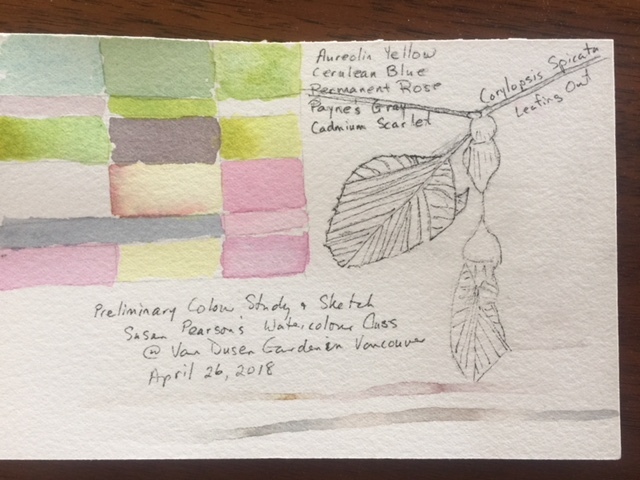 And I'm quite pleased with the planning sketch itself, which also lists the paint colours I used for the mixing -- they have such magical names, I think. . . Comments below, as you know -- they're always so welcome! Thanks, and Happy Friday! I really enjoyed The Honourable Woman. I watched it about 3 years ago. Have you watched Occupied, a Norwegian series? Those watercolours are so springlike. Enjoy your family visit. We started Occupied on the recommendation of my sister, but then we got distracted -- need to put it back on the list. . .
Just lovely, Frances. Your postcard is beautiful. And yes, the color names are enchanting. Regarding The Honourable Woman? It's been on my radar since 2014, but I've put off watching it for more escapist fare. I intend to see it eventually. Let us know what you think if you do watch it. You're wise to put it off for now. We just finished it -- very good, although the difficult politics mean a plot that requires careful, careful attention and constant puzzling. Acting is superb throughout and the central moral dilemmas absolutely engaging. OMG - You're going to LOVE that yarn!!! Also, couldn't watch the Honourable Woman. I'm too wussy about watching things that might upset me right now. But I hear it's awesome. It's really good. And also upsetting. You're wise to wait. I'm determined to get two pairs of socks from the yarn, following your lead, thank you! I love the yarn, especially for the London memories it brings. On the other hand, I find it a bit expensive, so I think I may just borrow the idea and, at some moment, arrange all my leftover bits and pieces in bold stripes. Just finished reading "East West Street" by Philippe Sands. Do you know it? It reminded me of "The Hare with Amber Eyes", equally gripping. No question the yarn is on the high side for sock yarn, especially with the postage to Canada added! I do really like supporting independent artisans and businesses, though, and this is lovely yarn from Blue-faced Leicester sheep, which is rather nice to know, I think. I don't know of East West Street but if it bears comparison to The Hare, it's going on my list post haste. Thanks for the recommendation. I love the name of the yarn and its colour inspiration. It's a rainy Saturday morning here so I'm not tempted to get out into the garden. More mundane chores need completion. I'm always interested to see your drawing/sketching/painting projects. In a couple of years I hope to take some courses, too. There will a family gathering here tonight - always a busy, good time. Have a great weekend. Did your rain clear up eventually? We've had a reasonably dry afternoon, but still grey enough to keep me inside. I'm sure your family gathering was lovely. . . Isn't it a cheery yarn? The socks will be fun to wear. Really enjoyed The Honourable Woman, and thought Gyllenhaal was terrific... also loved her in The Deuce. When they are ready, please show us your socks! I predict many family members will ask for a pair. Yes, I love the sock wool too. I find knitting very calming so I knit socks for the meditative repetition and the delight in seeing the pattern emerge from under my needles. My son has a thing for the ones I've made with Nori yarn. Haven't seen the Honourable Woman but I am out of the loop on much that is on TV - despite knitting and TV being perfect companions. Love your watercolours and love even more the idea of sticking a stamp on the back and sending them out as a small surprise ray of light for some lucky recipient. I LOVE the colour stories spun by Nori yarn -- as you say, calming and meditative to watch them emerge. It delights me to send the postcards out -- I have no expectation that they will be saved, but it's a fun way to make my time painting even more worthwhile. With you on The Honourable Woman and all things Gyllenhaal, Jake and Maggie both. Lest you be out of the loop on another great mini-series, check out Collateral (Netflix) with Carey Mulligan, another of my favorites. Enjoy the watercolor classes!! I've been taking a few classes in various media here and there, when I can find them, and love them but find I'm not good about practicing on my own....mostly because I find it hard to know where to start on a totally blank page. I like JG as well. And yes, we just finished Collateral -- Carey Mulligan has some of the same characteristics I value in MG. They both exude a sense of strength contained/restrained, and while they're obviously both very beautiful, it's a beauty that's not flashed about. They hint at complex layers of personality, not ever giving too much away. . .
Oh that sock yarn! I must get some, even though socks are one thing I have never knitted. Perhaps Kid 2 ... Also loving your watercolour explorations - something I plan to do one day, when I have time. I was probably 45, maybe 50, years into knitting (Mom started me when I was about 6, I think) before I knit my first sock, and I was blown away, mesmerised by the process, by recognising the engineering that went into shaping the heel, turning the right angle from leg to foot. Once you've figured them out, they're something you can do without a pattern and they're really portable -- and always useful. I hope that when you have time to take up watercolour (again? more?) that you'll also have time to post -- I'd love to see what you'd do (I can imagine you being brilliant at food illustration . . .
OMG, I think I love that yarn. I'm going to need more socks as well. Amazing how walking miles and miles in boots repeatedly with frequent washing takes its toll on socks. Isn't it great?! I have as many socks as I need right now, especially as I've begun mending them as they wear (and I don't wash too often, tbh, relying on wool's bactericidal properties to keep them fairly odor-free (nor do I wear mine to walk miles and miles in boots ). But someone in the family always seems to have just worn out a pair, so it's good to have another pair on the needles always. And such a portable project.